By Paul Streicker, Streicker & Company Inc.
Organic positioning entails first designing and then refining your site so that it shows up near the top of its category in unpaid search engine listings. Unpaid listings are the main body of listings, not the ads surrounding them. Unlike a paid campaign, you don't pay Google or Microsoft for a good position. Having sponsorship ads in the appropriate places helps with positioning, but tailoring your site to suit search engine preferences is much more important. Even more important is answering the questions your customers might ask. However, organic improvements are not free. They cost you in terms of work, money and patience. You will rely on all three to improve the site for better positioning. There are two types of organic improvements. Some are visible to the naked, nontechie eye, and others are invisible, found in your site's source code and decipherable by those who understand scripting, the languages used in communications between geeks and machines. The most important suggestion actually applies to every facet of your market communications. Does your site address topics of interest to your customers? Your customer does not want to hear you bragging about yourself. He wants solutions to the problems sitting in front of him on his desk. You know that from Marketing 101. Here, good copy has an additional benefit. Give your customers information they want and they will come back. Browsers see the return visits, improve your position because you are popular and more people see you because you have better position. More traffic improves your position again and the cycle repeats itself. 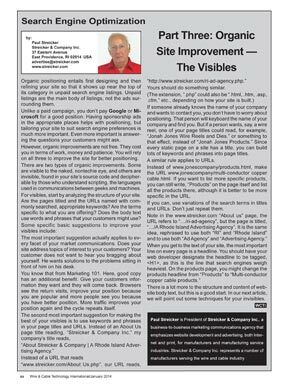 The second most important suggestion for making the best of your visibles is to use keywords and phrases in your page titles and URLs. Instead of an About Us page title reading, "Streicker & Company Inc." my company's title reads, "About Streicker & Company | A Rhode Island Advertising Agency." Instead of a URL that reads "www.streicker.com/About Us.php", our URL reads, "http://www.streicker.com/ri-ad-agency.php." Yours should do something similar. (The extension, ".php" could also be ".html, .htm, .asp, .cfm," etc., depending on how your site is built.) If someone already knows the name of your company and wants to contact you, you don't have to worry about positioning. That person will keyboard the name of your company and find you. But if a person wants, say, a wire reel, one of your page titles could read, for example, "Jonah Jones Wire Reels and Dies," or something to that effect, instead of "Jonah Jones Products." Since every static page on a site has a title, you can build lots of keywords and phrases into page titles. A similar rule applies to URLs. Instead of www.jonescompany/products.html, make the URL www.jonescompany/multi-conductor copper cable.html. If you want to list more specific products, you can still write, "Products" on the page itself and list all the products there, although it is better to be more specific in the URL. If you can, use variations of the search terms in titles and URLs. Don't just repeat them. Note in the www.streicker.com "About us" page, the URL refers to "…/ri-ad-agency", but the page is titled, "…/A Rhode Island Advertising Agency". It is the same idea, rephrased to use both "RI" and "Rhode Island" and to use both "Ad Agency" and "Advertising Agency." When you get to the text of your site, the most important line on every page is a headline. You should have your web developer designate the headline to be tagged <H1>, as this is the line that search engines weigh heaviest. On the products page, you might change the products headline from "Products" to "Multi-conductor copper cable products." There is a lot more to the structure and content of website body text, but this is a good start. In our next article, we will point out some techniques for your invisibles. Paul Streicker is president of Streicker & Company Inc., a business-to-business marketing communications agency that emphasizes website development and advertising, both internet and print, for manufacturers and manufacturing service industries. Streicker & Company represents a number of manufacturers serving the wire and cable industry. This is the third in a series of articles being published bi-mothly in Wire & Cable Technology. Part one is here. Part two is here. Part four is here. Part five is here.